Neither County Woodburning Centre nor any of their associates or employees can accept any liability for errors or omissions on this web site. We make every effort to provide accurate information, but errors and omissions are possible. Dimensions and other specifications given on this site are mostly as provided by the manufacturer and may be approximate (sometimes manufacturer-supplied information is contradictory). Specifications may change without notice. Please confirm any specific details before ordering. All prices shown or given are include VAT at the prevailing rate. All goods and prices are subject to availability from our suppliers. You can pay by BACs, debit card or credit card. Goods remain the property of the supplier until paid for in full. Free standard delivery is available for the majority of orders over £250 to mainland UK, except certain Highland postcodes, which incur a subsidised charge of £50-£150. Additional delivery charges may apply for orders to Ireland or Northern Ireland. Purchases under £250 incur a nominal £25.00 delivery fee. BACS payments must be cleared before goods can be released from stock. Delivery of stoves to Ireland or Northern Ireland is available for selected products only. 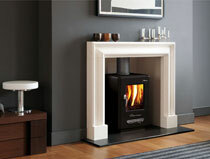 We can deliver stoves outside the UK, Ireland and Northern Ireland. Delivery prices will vary depending where the stove is being shipped. Your goods will be delivered on a 10 tonne delivery vehicle (about the size of a bin wagon). Please let us know, as soon as possible, if there will be a problem with access, so we can make alternative delivery arrangements. (if you have not notified us you will be recharge a re-delivery cost. The driver will move the stove to the nearest wheel point, depending on access. The driver will be unable to move the goods across gravelled, or unfinished drives, through narrow openings, or up steps. It is your responsibility to choose a product which suits your needs. Once we have delivered your product, you are responsible for storage and installation. It is your responsibility to ensure that products are installed correctly and in compliance with current Building Regulations. Contact the Building Control Officer of your Local Authority to find how these regulations apply to you. Telephone and internet sales to individuals (not businesses) are covered by the Consumer Contracts Regulations 2014. A customer has the option to cancel any order between the time of placing it and 7 working days after delivery. Cancellations must be in writing by post and quoting the Order Number. Under the Consumer Contracts Regulations 2014 you have the right to receive a refund within 7 working days of cancellation. We normally pay refunds within 7 working days of cancellation or when goods have been returned safely (whichever is the latter). You are advised to retain the packaging. You will find it difficult to return the item without appropriate packaging. The goods must not have been fitted, installed or used in any way. The goods must be unmarked and free from blemishes of any kind, and you must return them in a saleable condition. All spare parts are non returnable and non refundable due to being a special order. The cost of returning the item to us is your responsibility and usually costs between £40 - £70 or more depending where you live and who you return ii with. If any stove or cooker was not in stock and we have to place the order. A restocking fee will be applied to all good of 15% (stoves) and 20% (cookers) this will be deducted of your final refund. Please also note if the delivery to you was free this charge will also be taken off the total refund for example. Contract of Sale between the Purchaser (the customer) and the Seller (County Wood Burning Centre Ltd) begins when the Seller notifies the Purchaser of despatch.